Total knee arthroplasty (TKA) is the most common surgical remediation for patients with long-standing osteoarthritis (OA). A major clinical barrier that has been noted following TKA surgery is persistent muscle atrophy and weakness (Walsh et al., 1998; Mizner et al., 2005; Valderrabano et al., 2007; Halinen et al., 2009). After TKA, ambulation and stair climbing speeds have been shown to be half that of age-matched controls one-year post-surgery (Walsh et al., 1998). Additionally, it has been reported that the gait speed of patients who have undergone TKA is 16-22% less than that of healthy patients (McClelland et al., 2009). Further investigation has suggested that atrophy and failure of voluntary activation contributes to the majority (~85%) of strength lost in leg muscle tissue, and that the quadriceps of patients undergoing TKA are as much as 40% weaker 1 year after surgery when compared to healthy controls (Ouellet et al., 2002; Mizner et al., 2005). Limitations to successful rehabilitation of these patients may include the pre-surgical decrease in voluntary muscle activation and force production, but recent studies point to persistent quadriceps and plantarflexor atrophy as the main contributors to decreased strength and marginal return of physical function even after 1 year of recovery (Valderrabano et al., 2007; Meier et al., 2009). Thus, it is clear that long-term deficits are demonstrated by patients undergoing TKA surgeries, warranting investigation into the mechanisms preventing recovery or inducing atrophy after these operations (Snyder-Mackler et al., 1994; Walsh et al., 1998; Antolic et al., 1999; Eastlack et al., 1999; Valderrabano et al., 2007; Palmieri-Smith et al., 2008). During TKA surgeries, a tourniquet is often applied to the proximal thigh to stop blood flow and maintain a clear surgical field. Muscle cells have been found to be particularly sensitive to tourniquet use, as ischemic conditions cause damage to tissue beds that increases relative to the duration of ischemia (Hammers et al., 2008). This phenomenon is caused by biochemical processes that drive metabolism in myocytes. Between meals, approximately 80% of skeletal muscle energy is generated by a continuous supply of free fatty acids being completely oxidized to produce adenosine triphosphate (ATP), a process that represents 95% of the total metabolism in the lower extremities (Ruderman et al., 1977). During ischemia, this supply of circulating free fatty acids as well as oxygen is cut off, forcing ATP demand to be met solely by burning up endogenous phosphocreatine (PCr) and glycogen stores. These reserves are rapidly depleted, and their usage creates localized regions of low pH conditions within myocytes, ultimately inhibiting glycolysis via a negative feedback loop (Bangsbo et al., 1996). Following surgery, the tourniquet is released and blood flow is re-established to the surgical site (reperfusion event). The initial ischemic stress placed on myocytes is exacerbated during reperfusion, catalyzing a second phase of injury through the rapid production of reactive oxygen species (ROS) that are in significant excess of the endogenous buffering capacity of muscle cells. At the cellular level, these free radicals induce oxidative damage to mitochondria, proteins, lipids, and DNA. As a result, both tissue swelling and vascular endothelial cell dysfunction result in local inflammation as well as microvascular dysfunction, and can render areas of muscle that have undergone the most damage necrotic (Kalogeris et al., 2012). One mediator exacerbating muscle damage may be the inflammatory pathway stimulated by ischemia-reperfusion injury (IRI). Studies investigating the relationship between tourniquet use and IRI have indicated that there is an increase in the levels of IRI-associated inflammatory cytokines following tourniquet use (Tran et al., 2011). Additionally, research has demonstrated increased circulating levels of the inflammatory cytokines interleukin-1 (IL-1), IL-6, and tumor necrosis factor-α (TNF-α) in the plasma of rats within 60 minutes of reperfusion following ischemia. The effects of IRI in in this model were significantly attenuated when treated with polyclonal antibodies against TNF-α or an IL-1 receptor agonist, suggesting that these cytokines play a key role in IRI (Seekamp et al., 1993). Presumably, ROS-mediated damage to cells resulting from reperfusion following ischemia initiates an inflammatory response characterized primarily by the production of these cytokines, as shown by their upregulated presence in plasma samples. 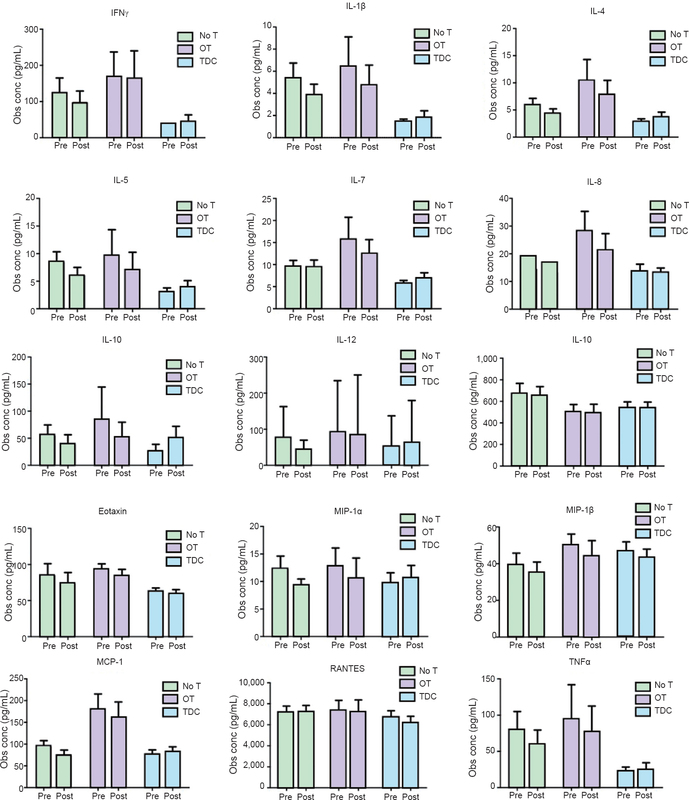 Muscle catabolism is associated with an increase in the production of inflammatory cytokines such as IL-1, IL-6, and TNF-α, and it has been shown that IL-6 signaling through the JAK/STAT3 pathway is linked to acute muscle atrophy events (Bonetto et al., 2011; Costamagna et al., 2015). Furthermore, IL-1, IL-6 and TNF-α are present in elevated amounts in the plasma of patients experiencing myocardial infarctions as well as renal ischemia-reperfusion injury, suggesting a role of these cytokines in muscle and tissue atrophy (Nian et al., 2004; Li et al., 2011; Malek et al., 2015). Overall, these previous studies provide some foundational evidence that tourniquet use during TKA may increase the levels of IRI-related cytokines and induce inflammatory signaling that plays a role in muscle catabolism and atrophy (Seekamp et al., 1993; Nian et al., 2004; Bonetto et al., 2011; Li et al., 2011; Tran et al., 2011; Costamagna et al., 2015; Malek et al., 2015). The goal of this experimental pilot study is to examine the influence that tourniquet use during TKA may have on inducing IRI in muscle tissues, as measured by the changes in circulating inflammatory cytokines following tourniquet use during these surgeries. Through establishing a measurable link between tourniquet use during TKA and induction of IRI, we aim to provide guidance for future therapeutics which may be used to counteract the effects of TKA-induced IRI, in the hopes of reducing patient recovery time as well as limiting initial muscle atrophy events after surgery. This study includedmen and women (18 years and older, n = 50) who were scheduled to undergo TKA surgery with an orthopedic surgeon at the orthopedic medicine clinic at the Keck School of Medicine of the University of Southern California (USC), USA. An insitutional review board approval was obtained from the USC Keck School of Medicine (HS-12-00534). Subjects were recruited by an orthopedic surgeon or study team member during a pre-surgical office visit. Randomization of study subjects was not performed, as use of a tourniquet was determined by the orthopedic surgeon; the surgeon determined if a tourniquet was required based on the necessity for a clear field and whether it was necessary to ensure a rigid bone-implant cementation. Three groups were established: no tourniquet, operative tourniquet, and tourniquet during implant cementation groups. Eighteen subjects were enrolled in each group. Exclusion criteria were pregnancy, peripheral vascular disease, or any uncontrolled medical conditions such as heart, liver, kidney, blood, or respiratory disease. In situations where participants sorted into the 'no tourniquet' group were later determined to require a tourniquet, these participants were considered part of the control, non-tourniquet group under an intention-to-treat (ITT) analysis. All subjects had TKA surgery as per standard surgical protocol established at USC. The TKA procedures followed were in accordance with the ethical standards of the responsible committee on human experimentation (institutional and national) and with the Helsinki Declaration of 1975, as revised in 2000 and 2008. All patients underwent primary total knee arthroplasty with minimally invasive techniques and cemented implant prostheses (Zimmer Inc., Warsaw, IN, USA). All of the operations were performed by the senior surgeons, and involved a midline skin incision and trivector medial parapatellar approach. Subjects in the operative tourniquet group had the tourniquet inflated from initial incision to completion of cementation while patients in the tourniquet during cementation group had the tourniquet inflated only during cementation of the implant. Tourniquets in both groups were inflated to 275 mmHg (1 mmHg = 0.133 kPa) or greater and were deflated after cementation. Cuff time ranged from 8 minutes to 90 minutes across all groups. Tourniquets were released at the completion of patella cementation, and the knees were subsequently held in extension with compression of the patella for at least 10 minutes as the cement completed polymerization. Surgical anesthesia was administered with an epidural, spinal, or general anesthetic, along with a preoperative femoral nerve block used for analgesia. For inflammatory cytokine analysis, 8 mL of blood was collected at baseline from the median cubital vein, just prior to cuff inflation (tourniquet groups) and 8 mL of blood was again drawn at the end of surgery, after cuff deflation (tourniquet groups). Total blood drawn did not exceed 16 mL. Venipuncture site was determined by the anesthesiologist, but in general was an antecubital vein. Blood samples were collected within 20 minutes following cuff deflation. Serum was then extracted from patient whole blood through high-speed centrifugation and analyzed with the Bio-Plex Pro™ Human Cytokine 27-plex Assay (Bio-Rad Laboratories, Hercules, CA, USA) measuring FGF basic, Eotaxin, G-CSF, GM-CSF, IFN-γ, IL-1β, IL-1ra, IL-2, IL-4, IL-5, IL-6, IL-7, IL-8, IL-9, IL-10, IL-12 (p70), IL-13, IL-15, IL-17, IP-10, MCP-1(MCAF), MIP-1α, MIP-1β, PDGF-BB, RANTES, TNF-α, and VEG. If results were out of range, they were dropped from the analysis. Sample characteristics were reported for each group, comparing patient characteristics for the total sample, as well as by initial and actual treatment. ITT analyses were performed comparing the change from pre-to-post values in cytokines across initial treatment assignment using the Kruskal-Wallis H-test, a non-parametric corollary to an variance analysis test. This was due to the preponderance of variables with unequal variances and non-normal distributions. Additionally, Cohen's d was calculated to estimate the effect size of the mean difference between groups. As a general note, Cohen's d represents how many standard deviations apart the means are: in general, 0.2 is considered small, 0.5 is moderate, 0.7 is large. Further analyses were performed using the same methods on the actual treatment received. Analyses were performed using SPSS 21.0 software (IBM, Armonk, NY, USA). A total of 54 patients undergoing TKA surgeries were enrolled in this study and separated into three equal groups: no tourniquet (No T), operative tourniquet (OT), and tourniquet during cementation (TDC) ([Figure 1]). The average length of operative tourniquet inflation was 45.8 minutes (+/- 8.5 minutes) compared to 9.3 minutes (+/- 1.5 minutes) for the tourniquet during cementation group. In four instances, the surgeon was unable to collect blood and tissue samples prior to the start of surgery. These four patients were thusdropped from the study and subsequently removed from analyses. The demographics of the 50 patients included in the study are shown in [Table 1]. Under the intent to treat analysis, the results generally showed constant or decreasing levels of cytokines in the operative tourniquet and no tourniquet groups and constant or increasing levels in the tourniquet during cementation group ([Figure 2]). 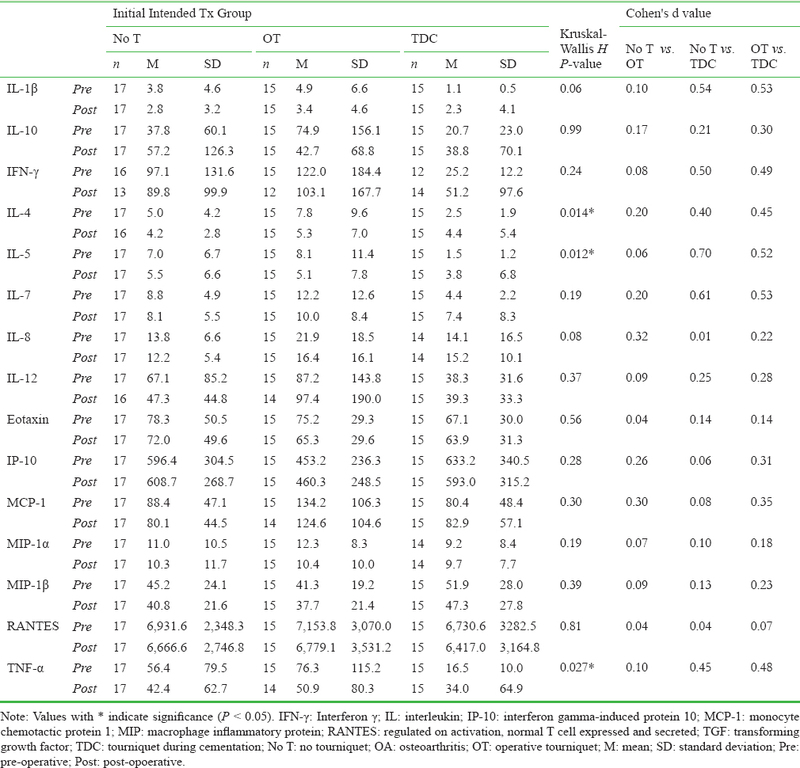 IL-4, IL-5, and TNF-α were the only cytokines to exhibit a statistically significant difference between groups, with decreased cytokines following surgery in the no tourniquet and tourniquet groups and increased cytokines following surgery in the tourniquet during cementation group ([Table 2]). 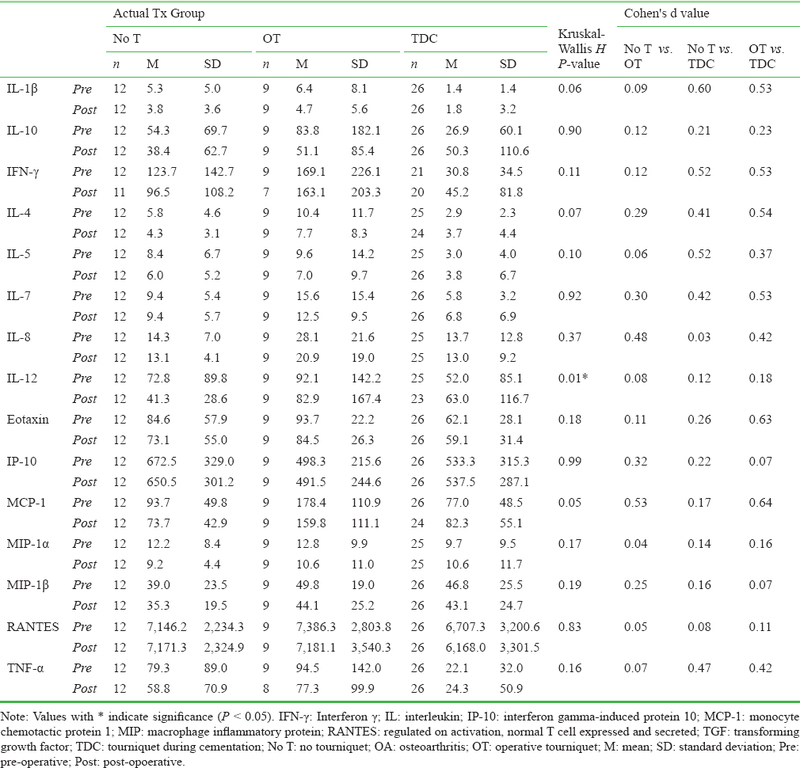 IL-1β exhibited similar differences between the three groups that trended towards significance (P = 0.06), decreasing in the operative tourniquet and no tourniquet groups and increasing in the tourniquet during cementation group ([Table 2]). Figure 2: Preoperative and postoperative serum concentrations (conc) of inflammatory cytokines (pg/mL) based on an intention-to-treat analysis. Note: Pre- and postoperative serum concentrations of inflammatory cytokines measured for the no tourniquet, operative tourniquet, and tourniquet during cementation groups. Blood was obtained at baseline, just prior to cuff inflation (tourniquet groups) and again at the end of surgery, after cuff deflation (tourniquet groups). Samples were analyzed with the Bio-Plex Pro™ Human Cytokine 27-plex Assay. Figure is based on intention-to-treat analysis and all data are displayed as the mean ± standard deviation (Kruskal-Wallis H-test and Cohen's d). IFN-γ: Interferon γ; IL: interleukin; IP-10: interferon gamma-induced protein 10; MCP- 1: monocyte chemotactic protein 1; MIP: macrophage inflammatory protein; RANTES: regulated on activation, normal T cell expressed and secreted; TGF: transforming growth factor; TDC: tourniquet during cementation; No T: no tourniquet; OA: osteoarthritis; OT: operative tourniquet. When the analysis was performed with subjects grouped according to the actual treatment they received, the data is consistent with the ITT analysis in that levels of cytokines generally decreased after surgery in the no tourniquet and operative tourniquet groups, while cytokine increases after surgery were noted in the tourniquet during cementation group ([Figure 3]). Statistically significant differences were found for IL-12, with the no tourniquet and operative tourniquet groups exhibiting decreases after surgery, and the tourniquet during cementation group demonstrating an increase in IL-12. MCP-1 and IL-1β exhibited similar patterns, which trended towards significance, of decreasing postoperatively in the no tourniquet and operative tourniquet groups and increasing after surgery in the tourniquet during cementation group (P values of 0.05 and 0.06, respectively) ([Table 3]). Figure 3: Preoperative and postoperative serum concentrations (conc) of inflammatory cytokines (pg/mL) based on actual treatment groups. Note: Pre- and postoperative serum concentrations of inflammatory cytokines measured for the no tourniquet, operative tourniquet, and tourniquet during cementation groups. Blood was obtained at baseline, just prior to cuff inflation (tourniquet groups) and again at the end of surgery, after cuff deflation (tourniquet groups). Samples were analyzed with the Bio-Plex Pro™ Human Cytokine 27-plex Assay. Figure is based on actual treatment groups and all data are displayed as the mean ± standard deviation (Kruskal-Wallis H-test and Cohen's d). IFN-γ: Interferon γ; IL: interleukin; IP-10: interferon gamma-induced protein 10; MCP-1: monocyte chemotactic protein 1; MIP: macrophage inflammatory protein; RANTES: regulated on activation, normal T cell expressed and secreted; TGF: transforming growth factor; TDC: tourniquet during cementation; No T: no tourniquet; OA: osteoarthritis; OT: operative tourniquet. The data from this prospective study demonstrated that induction of IRI, based on global inflammatory cytokine changes, shows either a statistically significant difference or one that is trending towards significance with altered tourniquet use in TKA surgeries. Based on our data, there is no significant increase in the pro-inflammatory cytokine profile of patients who received no tourniquet during surgical procedure and those receiving tourniquet application throughout the procedure. However, the use of a tourniquet when applied solely during implant cementation did result in statistically significant, or trending toward significant, increases in the expression of specific inflammatory cytokines (TNF-α, MCP-1 and IL-1β) as compared to full-time tourniquet use or lack-of tourniquet use.This difference potentially outlines differences in the relative risk of ischemia-reperfusion injury to patients depending on the time at which a tourniquet is applied during TKA surgery. Inflammation occurring in IRI is shown to have a profound effect on immune responses. A recent study of renal IRI indicates that Th1 cells may exacerbate IRI while Th2 cells may attenuate the effects IRI. Th1 cells are known to produce TNF-α and IL-1β, both well-characterized inducers of IRI, while Th2 cells are characteristic in their release of IL-4, a cytokine associated with attenuation of IRI (Yokota et al., 2003; Boros et al., 2006). Interestingly, in the intent-to-treat analysis, TNF-α and IL-4 were two of the three cytokines found to be significantly differentially expressed between groups with tourniquet during cementation as opposed to operative tourniquet or no tourniquet. The third, IL-5, is another cytokine characteristic of a Th2 inflammatory response. Through this intent-to-treat analysis, both pro-IRI (TNF-α and IL-1β) and anti-IRI (IL-4 and IL-5) cytokines were upregulated in response to tourniquet application during cementation, preventing definitive conclusions as to the effects of tourniquet use during cementation on potential induction of IRI in total knee arthroplasty. In the analysis of groups according to the actual treatments received by patients, IL-12 was the only cytokine found to be differentially upregulated in patients receiving tourniquets during implant cementation and downregulated in patients with operative tourniquets or no tourniquet application. IL-12 promotes the growth of Th1 cells and inhibits Th2 cell expansion, indicating a potential role for this cytokine in the induction of IRI when tourniquets are applied during cementation (Hamza et al., 2010). Our analysis revealed similar increases in the concentrations of IL-1β (trending towards significance, P = 0.06) and MCP-1 (P = 0.05) in patients receiving tourniquet only during implant cementation, which are noteworthy due to the previously described role of IL-1β in IRI, as well as the involvement of MCP-1 in reperfusion injuries (Gourmala et al., 1997; Sung et al., 2002). Therefore, through the actual treatment analysis, there is some indication that tourniquet during cementation in TKA may produce an inflammatory response indicative of IRI. However, it is unclear why tourniquet use throughout the procedure did not show similar changes in inflammatory cytokines, or why both anti-inflammatory and pro-inflammatory cytokines were found to increase with use of tourniquet during cementation in the ITT group. One potential cause for the lack of significant directional cytokine changes found in this study is the complexity of the human immune response to knee injury. The cytokine profile of patients may vary according to several factors: time of initial injury, extent of injury, the patient's comorbidities, BMI, immune status, and any other acute or chronic injuries that were not addressed in this study (Furman et al., 2015). Moreover, the interplay of cytokines and the variability of baseline levels of inflammatory markers presents another challenge to analyzing cytokine profiles. For example, patients with chronic osteoarthritis, such as those undergoing TKA, have been identified as having high levels of IL-6, TNF-α, IL-17, and IL-18 that could confound the measurement of inflammatory cytokine changes from tourniquet use. On the other hand, a protective effect from the anti-inflammatory IL-10 has been noted in patients who had osteoarthritis and exercised regularly (Wang et al., 2015). It is thus clear that variations in inflammatory cytokines in patients undergoing TKA may be caused by a number of factors beyond the variable use of a tourniquet during these surgeries. Still, there is value to this study's method of analyzing systemic changes in inflammatory cytokines as a means of studying IRI. For example, systemic measurements of cytokine changes may be a useful indicator for evaluating the severity of IRI in patients, which can then inform treating physicians of potential interventions to reverse severe incidences of IRI in an effort to reduce recovery times. In the tourniquet during cementation group, there were significant increases, and increases that trended towards significance, of inflammatory cytokines associated with IRI and muscle atrophy. These preliminary findings are encouraging, and should be explored in future studies with larger sample sizes, randomization of patients to treatment groups, and normalization of cytokine changes (adjusting for endogenous baseline levels of each patient) to determine if more significant results in global cytokine changes can be found. Furthermore, measuring ischemic metabolites before and after surgery would enhance the data by suggesting the ischemic states of patients at the time of blood sample collection. It has been shown that ischemic metabolite levels, including glucose, lactate, pyruvate and glycerol, differ with the use of a tourniquet during TKA (Ejaz et al., 2015). Through determining the ischemic states of patients, as well as inflammatory reactions following tourniquet use, future studies will be able to establish a more conclusive link between the use of tourniquets during TKA, ischemia and inflammation-mediated reperfusion injury. Antolic V, Strazar K, Pompe B, Pavlovcic V, Vengust R, Stanic U, Jeraj J (1999) Increased muscle stiffness after anterior cruciate ligament reconstruction-memory on injury? Int Orthop 23:268-270. Bangsbo J, Madsen K, Kiens B, Richter EA (1996) Effect of muscle acidity on muscle metabolism and fatigue during intense exercise in man. J Physiol 495:587-596. Bonetto A, Aydogdu T, Kunzevitzky N, Guttridge DC, Khuri S, Koniaris LG, Zimmers A (2011) STAT3 activation in skeletal muscle links muscle wasting and the acute phase response in cancer cachexia. PLoS One 6:e22538. Boros P, Bromberg JS (2006) New cellular and molecular immune pathways in ischemia/reperfusion injury. Am J Transplant 6:652-658. Costamagna D, Costelli P, Sampaolesi M, Penna F (2015) Role of inflammation in muscle homeostasis and myogenesis. Mediators Inflamm 2015:805172. Eastlack ME, Axe MJ, Snyder-Mackler L (1999) Laxity, instability, and functional outcome after ACL injury: copers versus noncopers. Med Sci Sports Exerc 31:210-215. Furman BD, Kimmerling KA, Zura RD, Reilly RM, Zlowodzki MP, Huebner JL, Kraus VB, Guilak F, Olson SA (2015) Articular ankle fracture results in increased synovitis, synovial macrophage infiltration, and synovial fluid inflammatory cytokines and chemokines. Arthritis Rheumatol 67:1234-1239. Gourmala NG, Buttini M, Limonta S, Sauter A, Boddeke HW (1997) Differential and time-dependent expression of monocyte chemoattractant protein-1 mRNA by astrocytes and macrophages in rat brain: effects of ischemia and peripheral lipopolysaccharide administration. J Neuroimmunol 74:35-44. Halinen J, Lindahl J, Hirvensalo (2009) Range of motion and quadriceps muscle power after early surgical treatment of acute combined anterior cruciate and grade-III medial collateral ligament injuries. A prospective randomized study. J Bone Joint Surg Am 91:1305-1312. Hammers DW, Merritt EK, Matheny RW Jr, Adamo ML, Walters TJ, Estep JS, Farrar RP (2008) Functional deficits and insulin-like growth factor-I gene expression following tourniquet-induced injury of skeletal muscle in young and old rats. J Appl Physiol 105:1274-1281. Hamza T, Barnett JB, Li B (2010) Interleukin 12 a key immunoregulatory cytokine in infection applications. Int J Mol Sci 11:789-806. Huang ZY, Pei FX, Ma J, Yang J, Zhou ZK, Kang PD, Shen B (2014) Comparison of three different tourniquet application strategies for minimally invasive total knee arthroplasty: a prospective non-4randomized clinical trial. Arch Orthop Trauma Surg 134:561-570. Kalogeris T, Baines CP, Krenz M, Korthuis RJ (2012) Cell biology of ischemia/reperfusion injury. Int Rev Cell Mol Biol 298:229-317. Li JP, Lu L, Wang LJ, Zhang FR, Shen WF (2011) Increased serum levels of S100B are related to the severity of cardiac dysfunction, renal insufficiency and major cardiac events in patients with chronic heart failure. Clin Biochem 44:984-988. Malek M, Nematbakhsh M (2015) Renal ischemia/reperfusion injury; from pathophysiology to treatment. J Renal Inj Prev 4:20-27. McClelland JA, Webster KE, Feller JA (2009) Variability of walking and other daily activities in patients with total knee replacement. Gait Posture 30:288-295. Meier WA, Marcus RL, Dibble LE, Foreman KM, Peters CL, Mizner RL, LeStayo PC (2009) The long-term contribution of muscle activation and muscle size to quadriceps weakness following total knee arthroplasty. J Geriatr Phys Ther 32:79-82. Mizner RL, Petterson SC, Snyder-Mackler L (2005) Quadriceps strength and the time course of functional recovery after total knee arthroplasty. J Orthop Sports Phys Ther 35:424-436. Mizner RL, Petterson SC, Stevens JE, Vandenborne K, Snyder-Mackler L (2005) Early quadriceps strength loss after total knee arthroplasty. The contributions of muscle atrophy and failure of voluntary muscle activation. J Bone Joint Surg Am 87:1047-1053. Nian M, Lee P, Khaper N, Liu P (2004) Inflammatory cytokines and postmyocardial infarction remodeling. Circulation 94:1543-1553. Ouellet D, Moffet H (2002) Locomotor deficits before and two months after knee arthroplasty. Arthritis Rheum 47:484-493. Palmieri-Smith RM, Thomas AC, Wojtys EM (2008) Maximizing quadriceps strength after ACL reconstruction. Clin in Sports Med 27:405-424. Ruderman NB, Goodman MN, Berger M, Hagg S (1977) Effect of starvation on muscle glucose metabolism: studies with the isolated perfused rat hindquarter. Fed Proc 36:171-176. Seekamp A, Warren JS, Remick DG, Till GO, Ward PA (1993) Requirements for tumor necrosis factor-alpha and interleukin-1 in limb ischemia/reperfusion injury and associated lung injury. Am J Pathol 143:453-463. Snyder-Mackler L, De Luca PF, Williams PR, Eastlack ME, Bartolozzi AR 3 rd (1994) Reflex inhibition of the quadriceps femoris muscle after injury or reconstruction of the anterior cruciate ligament. J Bone Joint Surg Am 76:555-560. Sung FL, Zhu TY, Au-Yeung KK, Siow YL, O K (2002) Enhanced MCP-1 expression during ischemia/reperfusion injury is mediated by oxidative stress and NF-kappaB. Kidney Int 62:1160-1170. Valderrabano V, Nigg BM, von Tscharner V, Frank CB, Hintermann BJ (2007) Leonard goldner award 2006. Total ankle replacement in ankle osteoarthritis: an analysis of muscle rehabilitation. Foot Ankle Int 28:281-291. Walsh M, Woodhouse LJ, Thomas SG, Finch E (1998) Physical impairments and functional limitations: a comparison of individuals 1 year after total knee arthroplasty with control subjects. Phys Ther 78:248-258. Wang X, Hunter D, Xu J, Ding C (2015) Metabolic triggered inflammation in osteoarthritis. Osteoarthritis Cartilage 23:22-30. Yokota N, Burne-Taney M, Racusen L, Rabb H (2003) Contrasting roles for STAT4 and STAT6 signal transduction pathways in murine renal ischemia-reperfusion injury. Am J Physiol Renal Physiol 285:F319-325. BW, RH, LD, PG, and TS provided conception, design, trial protocol and initiation of the project; BW was the study coordinator; IM, RR, AY, JM, and BW were involved in patient recruitment, data collection and entry; CL, JS, BW were responsible for data analysis and entry; RG, IB, BW, CL drafted and finalized the manuscript. All authors have read and approved the final manuscript.